A not so savvy Web person could’ve reacted like this, “Helloooo, can’t you read? Sales end on May 29, 2012 ”. But being in the Web business for a while, I’ve responded politely, “The sale end date should be listed on the registration page.” That person was polite too and he replied, “Thanks. It wasn’t on the iOS version of that page”. Sure enough, the iPhone version of this page doesn’t show when the sale ends. 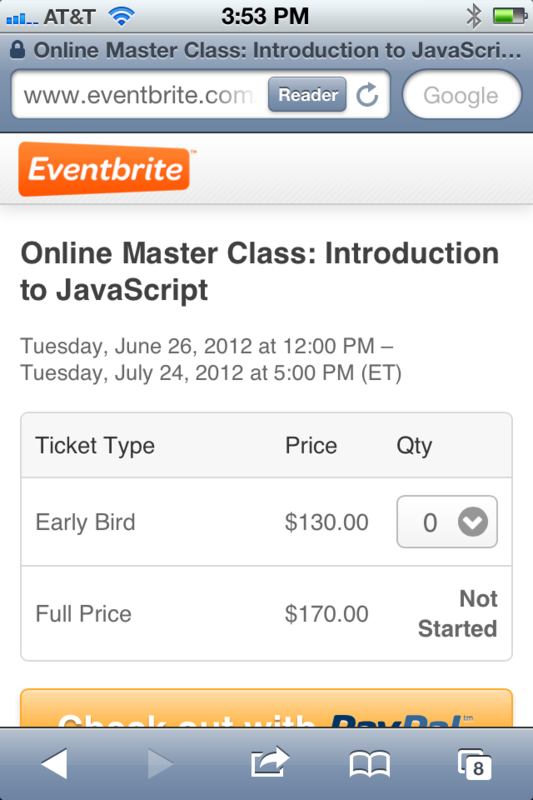 Apparently, the version of their CSS layout for iPhones didn’t allocate the room for the sale end dates. Moral: Don’t think people are stupid. The might be using “a wrong” device. If you’re running some Web development project yourself, try to allocate just a little bit of an extra cash for the usability expert who could have suggested a way to ensure that your Web site shows all important information no matter what the size of the user’s device is. Previous Is HTML5 Web 3.0?